Welcome to our blog hop with the super fun folks at Lawn Fawn! We are SO excited to be sharing inspiration from both design teams and products for the week 🙂 What’s a celebration without a giveaway….or two?! Details about that opportunity will be at the end of this post…now for the EYE CANDY…take it away team! I’m so excited to be part of this blog hop with Lawn Fawn. My project features a Lawn Fawn Scalloped Treat Box that was put together with Home Hobby Extreme Double-Sided Tape 1/8”. I burnished all the tabs with adhesive with my bone folder. I used the E-Z Runner® Grand Dispenser to adhere the scenery pieces down. The Big foot is on Thin 3D Foam Squares – Mix White. I’m a big fan of having my designs spill off of the base. I think it’s especially fun with the sweet treat box. Come join me as I show how to assemble these boxes on my blog. Click: Tsuruta Designs. To assemble the Goodie Bags, I used our E-Z Runner® Ultra Refillable Dispenser since it’s super strong and fabulously clear! I dressed each one up with the most adorably stamped images from the Booyah set. Then popped them up on to the die cuts using 3D Foam Squares – White, Regular. To finish each one off, I added a few sequins using our Dodz Adhesive Dots Mini. Now they are ready to be filled and handed out! I assembled the Lawn Fawn’s Scalloped Treat Box die, with the Perfectly Plaid Fall Petite Paper Pack using Scrapbook Adhesives by 3L® E-Z Dots® Permanent Refillable Dispenser. I applied a strip of burlap with the Dual Tip Glue Pen at the base of the box. Next, I gently rubbed coordinating fall color glitter to the various sizes of the 3D Foam Leaves pack. Tying a burlap bow, I placed it on top with a Dodz Adhesive Dots Mini. For the finishing touch, I added a glittered 3D Foam Leaf on top of the bow. Blog Hop with Lawn Fawn – Day 1. This entry was posted in 3D Foam Squares, Adhesives, Announcement, Crafts & Tutorials, E-Z Runner® Dispensers, Extreme Double-Sided Tapes, Fall, Gifts, HomeHobby by 3L, Party Favors, Seasonal Craft Ideas and tagged 3D Foam Leaves, 3D Foam Squares Mix White, 3D Foam Squares Regular White, Adhesive Dots Mini, AJ Otto, Amy Tsuruta, Announcement, Autumn, Blog Hop, Copic Marker, Dual Tip Glue Pen, E-Z Dots Permanent, E-Z Dots Permanent Refillable, E-Z Dots Refill Value Pack, E-Z Runner Grand Dispenser, E-Z Runner Grand Ultra Strong Refill, E-Z Runner Ultra Refillable, Extreme Double-Sided Tape 1/8", Fall, Gift Bag, Gift Box, Halloween, HomeHobby by 3L, Lawn Fawn, Thin 3D Foam Squares White. Bookmark the permalink. 81 Responses to "Blog Hop with Lawn Fawn – Day 1"
I love the huge inspiration! The best parts of a blog hop are to find a lot of new ideas to use stamps and other products to realize beautiful projects and, of course, the prize!!! I love the inspiration and the giveaways!! What cute projects! Love the glittered leaves. What a great idea! I get so many new ideas on blog hops! I love these cute treat boxes and bags, so adorable. And so many occasions to make them for. How FUN…I love how different our projects are. Amy, AJ and Latisha’s treat boxes are just sweet. Latisha’s leaves on the bottom front look like sugary gumdrops and for this you DO need good quality adhesives! So beautiful! Great work ladies. My favorite part of blog hops is finding new people to follow. I love blog they are filled with inspiration, learning and teaching! Love the projects, love you and Lawn Fawn. Thanks for the chance to win. Love all the projects! My favorite part of blog hops are the wonderful inspiration and of course a chance to win some goodies! I love blog hops because of all the crafty ideas and finding new products. Such fun Halloween projects! I love the treat boxes and bags! 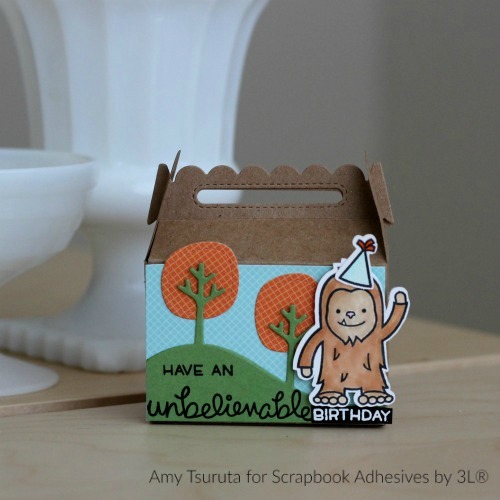 Great collaboration with Lawn Fawn and their delightful stamps and dies! Love your fabulous 3D Foam Squares for adding dimension and use them a lot! My favorite part of blog hops… seeing the delightful projects and all the inspiration! And a chance to win a great prize! I love hops because I get great ideas and inspiration from all the wonderful projects the DT shares. Also i get to see great products as well tfs. I definitely love the chance to win a prize and enjoy all the inspiring projects! These are so cute! Love DIY treat holders! Love the treat boxes! Thanks for the inspiration. Wonderful packaging. So cute you wouldn’t even care what was in them. My favorite part of blog hops? Winning products that I can’t afford to buy is one part of the reason I like blog hops. But there is more that I enjoy about them. I love meeting and following designers and seeing the latest products available. I love it when the designers share details about their card techniques. I also enjoy seeing the creativity. I prefer blog hops over Facebook and Instagram contests because there are more details about the cards and card making processes. Facebook and Instagram contests are easier to enter but I miss out on all the important details. I also enjoy supporting companies and designers by leaving comments and pinning on Pinterest and sharing about them on Facebook. We are a community. Blog hops are a wonderful way to stay connected. Cute 3D projects. Love my refillable Scrapbook 3L adhesives. My favorite part of blog hops and seeing what every one creates. Oh my what cute treat boxes. I want the glue pin they talked about to put on the strips of burlap. Thanks for sharing. Adorable treat boxes today, ladies! I Love them all!!! Looking forward to more fun and great inspiration all week long with two marvelous companies!!! Those are the cutest boxes! Would love to make these! I love all the inspirational ideas that come out of blog hops! Blog hops are great because you get to see so many different ideas for a common product. Those boxes are the cutest thing. I love fall and the colors! love all the ideas using the adhesives. boxes are simply adorable! I enjoy seeing all of the projects when I’m doing a blog hop. Have to admit that the best part is if I see my name as a winner. I love to win things – especially if they are 3L adhesives. My favorite part of blog hop is seeing all of the wonderful inspiring projects. Favorite part is seeing all the fabulous creations by all the talented designers. Love all the new ideas. I started using your products and love them!! I can’t wait to keep using more for my projects. Adorable treat boxes!!! Love Lawn Fawn! Thanks for all the wonderful ideas! I hadn’t thought about using my Dodz to adhere sequins, thanks for the great tip. Now I am excited to go and try it. Adorable treat boxes and bags! My favorite part of blog hops is learning about new products and techniques. Thanks for the chance to win! 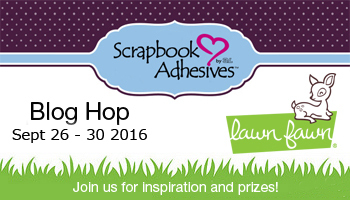 I love Lawn a Fawn and Scrapbook Adhesives products! Adorable projects! The best part about blog hops is the tons of inspiration from the different blogs. It’s a toss up. I love the ideas, but the chance to win prizes is also a great benefit. Thanks for the hop. Great ideas today. Love your fantastic products. Forgot to say I love to get ideas for the blog hop. I love blog hops for all the great ideas. Every designer has a different take on how to use products and that’s my favourite part! love seeing the projects and the giveaways are a nice bonus! Such cute projects! Your products make it so easy to put everything together! Forgot to say, the best part of blog hops is discovering new products and talent I haven’t seen before! It is amazing to see the different ideas using the same products. Your teams did a great job. I love seeing the fantastic projects that are created. As a cardmaker and scrapbooker, I truly appreciate how important adhesives are when it comes to making my projects look as good as they can! Keep up the good work! Such amazing projects here from the girls. Love these great boxes aND BAGS, THEY´RE SOOO COOL FOR SMALL GIFTS. I love blog hops because I usually end up finding new awesome designers who share the same passion for creating that I have and I also love to see new products and hava a chance to win something great! I love how cute all of these projects look! Really fresh and fun! 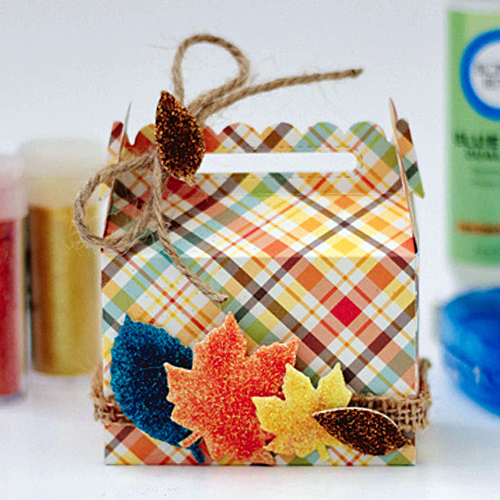 What cute treat boxes… I especially love those sparkly leaves! My favorite thing about hops is getting great ideas and the chance to get some great products to try. Great ideas. I especially like the little Goodie Bags. Great ideas! Thank you! And Big Foot is adorable! My favourite part of blog hops is seeing all the really neat ideas. Love the goodie bags…so cute! 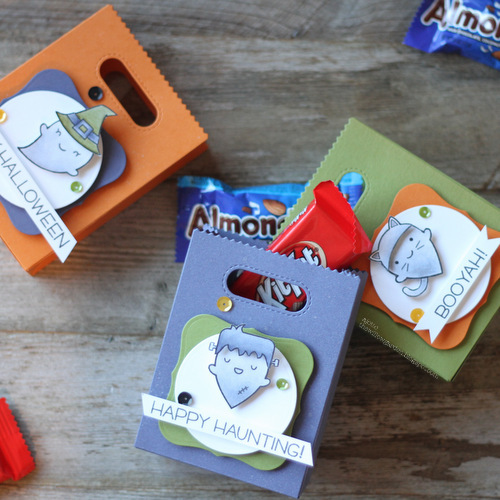 Oh, these treat boxes are so darn cute! I love the plaid papers and that Big foot! My favorite part of blog hops are the project ideas and giveaways. Blogs Hops are the Best for seeing new products, new ideas, new ways to use things. I need the inspiration and Lawn Fawn creations are just Darling! Love the inspiration blog hops provide! Love all these ideas and definitely need to get my hands on some of your products! I love all the awesome inspiration ideas here!! With the holiday season coming goodies bags are the best. My favorite thing about blog hops is that I get to learn about new blogs and see new ideas from different fellow crafters ? Cool projects. I like the little treat bags! My favorite thing about blog hops are seeing all the great ideas. Love the treat boxes could use the for parties. I love all the ideas from the fun samples on blog hops. I’m amazed how creative everyone can be. Great way to send treats. These treat holders are soooo darn cute!!! I LOVE Lawn Fawn!!!! FUN & FABULOUS treat bags and boxes!!! I love seeing all of this inspiration! I love Lawn Fawn! I love that we get to see new supplies, tools and techniques! My more creators the better! Gorgeous projects! This is a wonderful collab with Lawn Fawn! I love both of your companies! My favourite part about blog hops is the inspiration! I always enjoy seeing new products! Prizes are always fun too! Oooo thanks for a lovely hop. And giveaway!! !